Today is leap day, a date that happens once every 4 years. For any cachers doing date based challenges it is an important date for if they miss it, they will need to wait 4 more years before filling in this day in their calendars. I took a vacation day and headed an hour west to Marion NC to do some leap day caching. I managed to find 17 caches, including puzzles and multi-caches, as well as get a few miles hiking in. I didn't do any blog-worthy caches today, but I did managed to see a few interesting sights. In the evening I held a geocaching event at the local TCBY, and had most of the local cachers come out. Good times all around. The following are some pictures from my day. Last Saturday my wife and I went on a geocaching adventure in Charlotte NC. Most of that adventure was documented here: Geocaching Adventures: Octopus Garden. I saved our last adventure of the day for its own post. The cache description just said that there is an old abandoned house off in the woods. It goes on to say that it is likely a murder took place here, but otherwise it is not known why it is abandoned. It also went on to give very specific instructions on how to get to the house without trespassing on private property. We arrived at the parking coords about an hour before sunset, and started towards GZ. We had about 1/10th of mile walking on the shoulder of a busy road, then we took a left turn at a broken down gate and walked another 1/3rd of a mile down an overgrown pathway, and after a bit of searching around we arrived at the front door of the house. To say the house is run down is an understatement. There are no windows or doors, the porch has all but collapsed, and the roof has caved in in several spots. Definitely not your typical fixer-upper. When one approaches a structure like that one of the main concerns is cranky squatters. So it was a bit concerning when we got around to the side and started hearing tapping and shuffling noises coming from the front of the house. We determined that it was probably just the wind, so we continued on to the building. Suddenly my wife called out "Whoa! Buzzards!". It turns out the noises we heard were actually two huge buzzards walking on the roof. They finally had enough of us and flew off to a nearby tree to sit and stare at us. They didn't bother us again, but they certainly added to the creepy factor. The house is a complete disaster. There were TVs and other equipment strewn about, and there were several pairs of childrens shoes on the ground. Whatever happened here certainly didn't happen in a planned manner. We located the cache container and signed the log, then we started back to the car. This is definitely one of the creepier caches I've done, and certainly one of the more interesting ones. Pregnant lady belly or large concealed swag bag? On Saturday we had planned to go to a Geocaching event just south of Charlotte NC. For us Charlotte is 1.5 hours away, so we don't get to go there that often. ... turns out that the in-laws decided to stay home and watch Zeke for the day. This would free me and Debbie to go off on a day long adventure sans-offspring (well, the fully baked one at least). We settled on a compromise and went what I call geo-ikea-ching (ok, I never actually used that term, and I promise never to use it again). We spent the morning at Ikea, picking out furniture for Zekes new bedroom, then spelunking through their warehouse, and finally loading several tons of flat packed furniture into the mini-van. Somewhat exhausted we refueled with some fried chicken... say what you will about southern cuisine (my opinion is most of it is the type of dishes that results from losing a war and suffering through the resulting supply shortages, requiring the maximum use of everything that a human can stomach - liver mush? grits? collard greens? No wonder the North won), but fried chicken is a gift from the Gods. Once refueled we headed off to do what turned out to be an incredible afternoon of caching. Our first stop of the day was to tackle Octopus Garden. Octopus Garden is a puzzle cache. It is also the oldest cache in North Carolina, and the second oldest puzzle cache in the world. Like most puzzle caches the object is to solve some sort of puzzle, the answer to which provides the coordinates to the final cache container. We arrived at the listed coords and started working on the puzzle. We discussed possibilities of what the answer could be when suddenly my wife started laughing - she had figured it out. It was one of those "the answer is right in your face if you look at it in just the right way" type of deals, and she was looking at it in just the right way. With solution firmly in hand we headed off down the trails hand in hand (after all, she is my wifey) in search of GZ. We took a wrong turn, ended up on the wrong side of a creek, doubled back, found the right side of the creek, and finally made the grab. We walked about a half mile in total, which is quite a bit when you are hiking with a third trimester pregnant lady. She was feeling it a bit when we finally got back to the car. Since I wore out my caching partner, we headed off to nearby Idlewild Park so I could do some solo caching and she could rest up a bit. Idlewild Park is an amazing place to do some caching. It has some sportsball fields, a disc golf course, and miles of hiking trails. 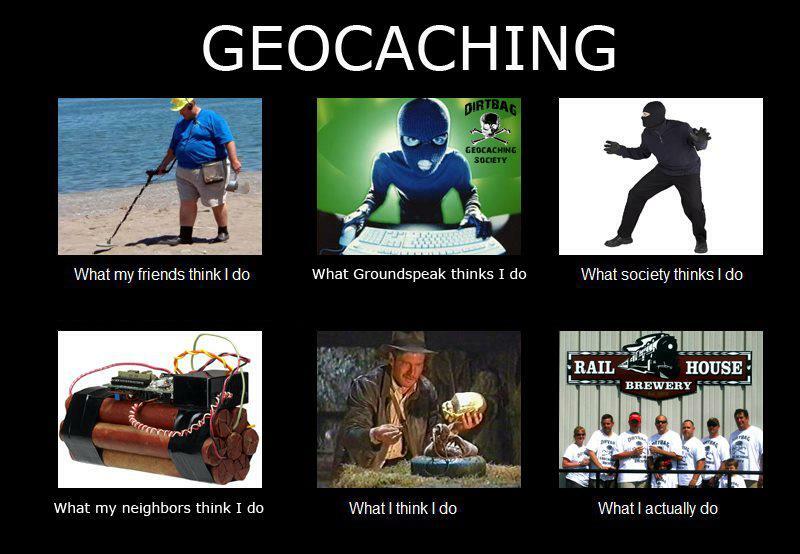 The caches are all top quality too. I found 5 caches there, and I ended up giving out 4 favorite points with my logs. Stairs carved into the side of the hill. Some of these caches included fake wildlife, awesomely painted ammo cans, and the most involved tree hanger cache I have ever seen (by several orders of magnitude). I don't want to give away too many spoilers, so let me just say that if you ever find yourself in the Charlotte area and don't head to Idlewild Park, you are missing out on some amazing caching experiences. I spent about 75 minutes in Idlewild Park before returning to the car and my resting wife. We then headed off to do a few more caches before finally ending up at the geocaching event. * Caching with my wifey? check. * Didn't break the pregnant lady (too much)? check. * Time spent outdoors? check. * Finished the day with good food, company, and cheer? check. Yep, its confirmed! All in all it was a fantastic day of caching with my wife. Now we get to unload the 2 tons of flat packed furniture from the van... yay. Yesterday my wife and I attended a geocaching event for the Band Of Geocachers - a fun group of cachers primarily in North and South Carolina (including yours truly), but also has many honorary international members. 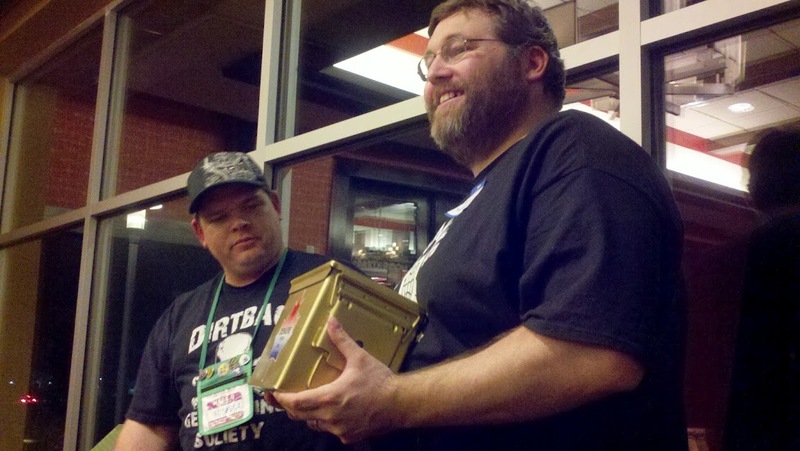 During this meeting, and very much to my surprise, I was presented with a golden ammo can as a celebration of my 1000th find. Readers of this blog may remember I hit my 1000th find while visiting my homeland of Canada over Christmas break, 2011. (if not, this may remind you: Geocaching Adventures: Millenium Cache). Apparently shortly afterwards planning began for the event last night. I really couldn't ask for a more special momento to celebrate this milestone, and I am truly thankful that this group of cachers went to so much trouble for little ol' me. I mean, its a golden ammo can with my name on it... for a cacher what could be better? Yesterday after finding the North Carolina Delorme Challenge, we went on to find some more caches. Due to certain circumstances involving toddlers and pregnant wives, I headed out to find a cache solo. My wife parked on the side of the road, and I jumped out and headed into the woods. Then I thought "Bah, I'm going 150ft into the woods, I won't need it". 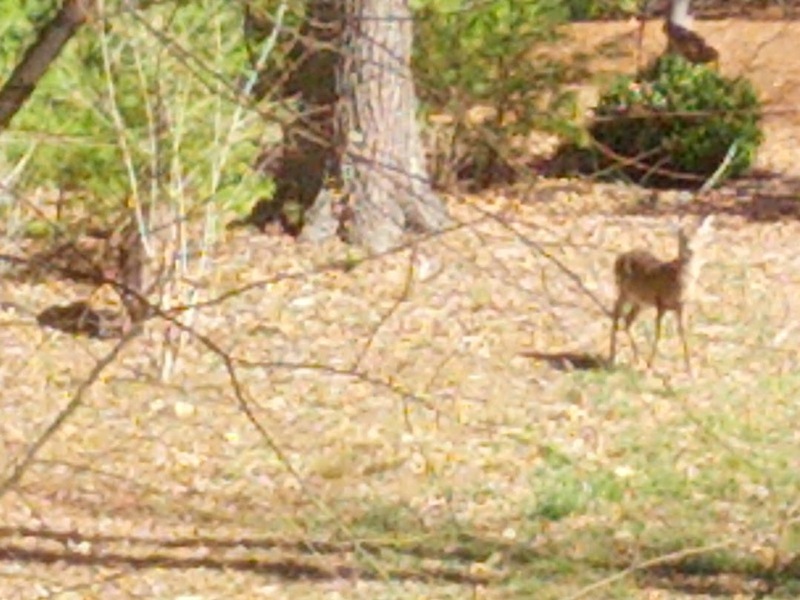 Then I saw the deer, and realized the magnitude of my mistake. The deer was standing 50ft away from me. After mentally kicking myself over the forgotten camera I remembered I had a camera on my phone. I reached down, pulled it from its belt holster, and snapped some pics. I then started back down my path, which was somewhat orthogonal to the deer. I expected her to run away at any moment, but she just stood there and stared at me. 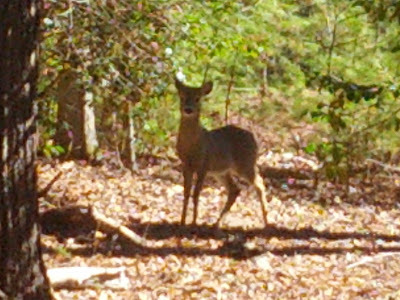 After a few feet I disappeared behind some foliage, and I saw her bend down to eat. 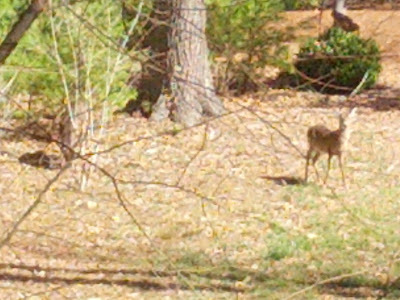 There were actually two deer, but one was obscured behind bushes the whole time. I got to within 30ft of GZ, and had circled around to the other side of the deer. It was then that I realized that the deer was standing on the cache. Literally. So I took some more pics with the phone, and the deer finally ran off. I then went in and grabbed the cache and signed the log. This was my first deer muggle. How cool is that? "Sweetie, Can we do the Delorme Challenge for North Carolina?" "I dunno, what is that?" "It is a geocaching challenge where we have to explore every part of the state of North Carolina." That night I ordered the North Carolina Delorme paper atlas. Since then we have gone on many adventures, many of which are documented here. We have driven from the highest points of the North Carolina mountains near the Tennessee line to the very edge of the Atlantic ocean, and all parts in between. Once we have found a cache on every page, we get the coordinates for the final cache. Once the final is found, the challenge is completed. I have been itching to head out and find the final cache every since we completed the last Delorme page. As regular readers may know, my wife is pregnant, and due in April. The final is 1.5 hours from our house, so every day that passes the journey gets harder and harder. Although I must say my wife is an amazing woman and so far she's let very few things, even being pregnant, stop her from going on adventures - the required proximity to bathroom facilities fluctuates however :) - but I digress. We tried to attempt this two weeks ago but the weather up in the mountains was unfavourable. So we planned for today. As is typical in such cases we got a snow fall last night, so our journey today was in doubt, but we decided to take the chance anyway. As it turns out it is a good thing we did as today was sunny, warm, and an all round beautiful day for caching. Bonus points for spotting the wife. So we arrived at the parking coordinates, left the car behind, and headed out on foot down a mountain trail 0.2 miles to the final. It was a wonderful walk down a nice flat path, with leaves on the ground to catch the mud. Zeke had a blast walking, and we had to hurry to catch up to him (an impressive feat for a 2 year old). When we arrived at GZ (ground zero) we started looking for the cache, even Zeke got involved in the process. It took a few minutes, but soon we had the final in hand. We took the requisite celebratory photos, signed the log book, and eventually decided to head back down the trail to the car. The North Carolina Delorme Challenge was an epic adventure, and it forced us to explore the state that we now call home. I am very glad that I took on this challenge, and went on an adventure that I will not soon forget. Note: Shamelessly stolen from the social web. I didn't create this, and I don't know who did. But, it does explain some things, doesn't it? And fills in a thought for each section. It actually ends up being pretty neat. I wrote an ETR a while ago for her, and today she published my second attempt on her blog. So please check out: Errant Thought Roundup 53: Guest Post. It is always interesting to explore places of historical interest in your own neighbourhood. In this case the object of interest is the Huntington Creek Railroad Bridge in nearby Morganton NC. This is actually a series of foot and rail bridges all running beside or underneath each other, some intact, some lying in ruins. I estimate from the evidence that four bridges existed here at one time or another. There are only two bridges still standing: a metal truss bridge, and a stone arch bridge. The stone bridge runs parallel to the truss bridge, but is about 15ft away, and 10ft lower. Some of the support structures remain for the other two bridges, but not enough to know what they looked like. There is a geocache located at this bridge, and my goal is to get to the base of the bridges and locate the cache. To get to GZ one needs to cross the creek. There are several approaches to the bridge available. One can walk across the stone bridge, or ford a rather wide creek. I'll leave the obvious third option of hoping aboard a train off the table as my hobo days are not quite upon me yet. I first chose the dry option and walked across the stone bridge. It is a narrow bridge, perhaps 6ft wide, 100ft long. I do not know what its intended purpose was but it seemed inadequate for a rail bridge, and there was no evidence of train tracks. There is a second issue with the bridge... namely there is no way to get down to the lower level from the other side. The bridge ends at the rail bed, which immediately drops off to a cliff. Unless I start to channel Spiderman (and who wants to do that, really?) There is no way I can get down to ground level to start my hunt from here. So I execute a retrograde maneuver and head back across the stone bridge and re-evaluate my options. The creek is about 20ft wide, and a foot deep at its deepest. I am wearing my hiking boots, and not really prepared for a creek fording. Also it is quite cold, being the beginning of February. This is North Carolina, but it still gets below freezing at night. So with an inner-voice exclamation of "Meh, what the heck! ", and "This will probably make a good blog post", I plunged (stepped gently) into the raging torrent (gently flowing) river (creek) and faced my death (mild yet chilly soaking of boots) in the name of exploration (yeah, exploration works). A few long seconds later I was soggy but safely on the other side and began my trudge (when one has boots full of water one is left with few options but to trudge) to the base of the bridges. It was at this point that I began my (ultimately fruitless) search for the cache. The cache description said that the truss bridge was "slightly used", so I was not expecting any traffic on the rails. I say this to explain the high pitched girly scream that escaped from Yours Truly when a train went by directly overhead about 5 minutes into my search. As a word of excuse, I was standing directly under the rails, which were 30ft above my head. and standing under the bridge supports so I didn't hear the train until it was literally above me. I am not sure if you have ever stood directly underneath a moving train, but if you haven't, you are in for an interesting and noisy experience. So after recovering from my sudden onset train induced mini heart attack, I kept searching for the next half hour or so. As it turned out I didn't find the container, but I did fine some stalactites in the rock that is used as bridge supports. This really underlines just how old these bridges are. The one pictured was about 6 inches long. Eventually I gave up the search, waded back across the creek, and tried to press the water from my boots before getting back into my van and drove on back home. This cache proves that it is not just about the numbers for me. I walked away without a smiley, but still had a great blog worthy adventure, and left with a smile on my face. When it comes down to it, isn't that really the whole point?